Blog – Page 2 – O.V.A.S. 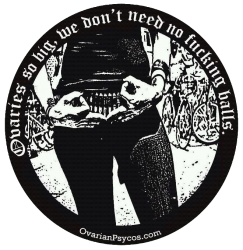 Join the Ovarian Psycos as we Take Back The Night this April’s full moon. We recognize April as Sexual Assault Awareness month and will honor the womxn who have suffered a sexual assault. “ELAWC reports that in 2012, there were 950 calls to its hotline for sexual assault, and 1,600 for domestic violence, with approximately 25% of these coming from Boyle Heights.” (Building Healthy Communities Boyle Height ELAWC Policy Report, December, 2013). In collaboration with Justice For My Sister collective, Mujeres de Maiz, community resources, and local bands we will Take Back the Night, our streets, OUR HOOD! Nota: FULL MOON Luna Rides are ONLY for womxn, queer womxn, trans, and gender non conforming individuals. Roll-out at 7 p.m. sharp! 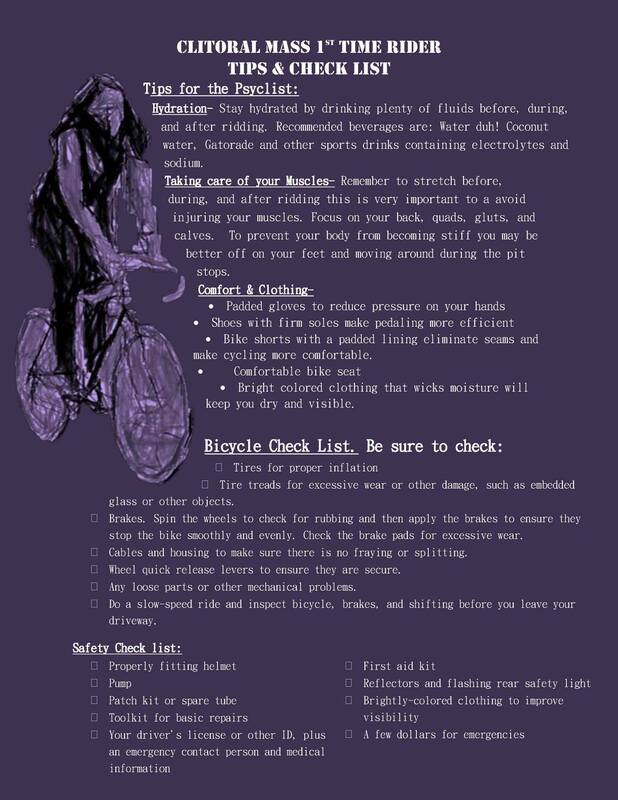 Please arrive on time so that you may do an A-B-C check up on your bici. Remember: NO RIDER LEFT BEHIND! Clitoral Mass is the largest bike ride in Los Angeles to date organized by and for womxn of color, trans-womxn; womxn identified, two-spirited and gender nonconforming folx. With our arsenal of “indigena understanding and urban hood mentality,” we are building movement in the spirit of rebellion passed down by our great grandmothers, reclaiming the autonomy of our spaces and bodies as we continue to resist the settler occupation of both. The theme for the 4th Annual Clitoral Mass ride is “Mobility and Immobility: Base Building & Reclaiming Spaces Beyond Our Streets” to continue much-needed dialogue and analysis around issues of mass incarceration, mass deportation, gentrification and state-sponsored genocide. Meet up for the ride will begin at 11AM Saturday, August 1, 2015 by the Olvera Street Gazebo with a bike repair station, photo booth and resources to greet riders. Festivities will begin with an opening ceremony featuring a blessing of the bikes, bike safety skits and yoga stretches lead by The People’s Yoga. We are excited to be collaborating with Chant Down the Walls and Incarceration Liberation Summer Theater Project to highlight the injustices of detention and deportation of immigrant communities. Along the route, community organizations such as North East LA Alliance, Youth Justice Coalition, Comida No Bombas LA, and others will engage riders in fun, informative sessions. Riders can expect multiple pit stops with live music, freebies, and the unique experience of riding with hundreds of other womxn identified, nonconforming riders through the urban and natural terrains of the city. That means you still have time to fix your bike, rent a bike, buy a bike or borrow a bike! This bike ride is open to gnc, two spirited, queer, cis and trans womxn only! Respect the space, check your privilege! 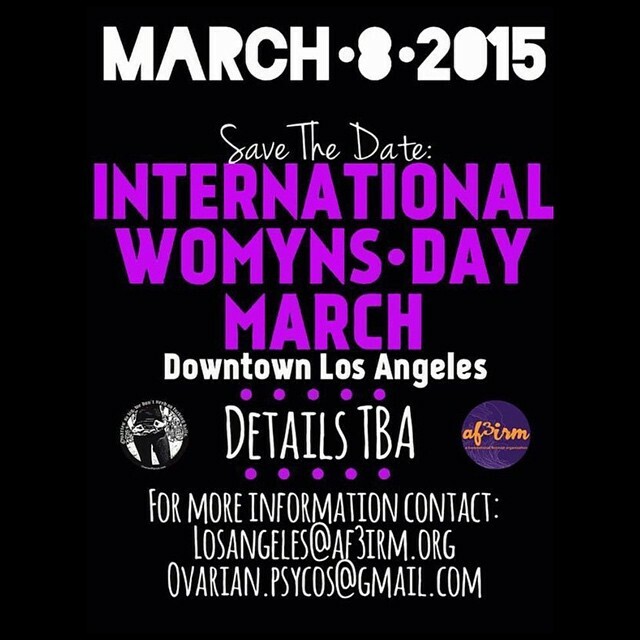 This year we will ride out from historic Olvera Street located in Downtown Los Angeles! Meet up: 11Am @ Olvera Street (845 N. Alameda ST,L.A. CA 90012) by the gazebo. Ovarian Psycos and the Clitoral Mass Committee have been working extra hard to make this happen. Want to join us to organize or volunteer that day? Meet us today and every Wednesday at La Concha (1214 E. 1st ST. LA, CA 90033) from 7-9PM. More info please go to: tinyurl.com/clitmassvolunteer Can’t make it that day? Send us an email at ovarian.psycos@gmail.com. Please share! 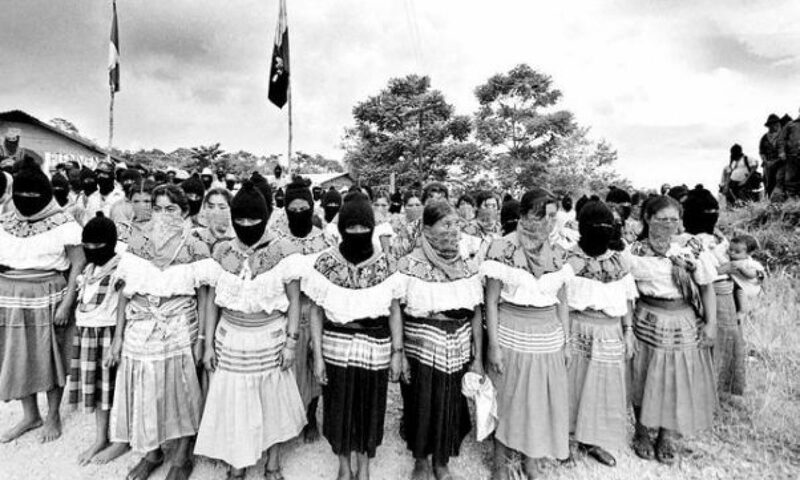 Sisters, Brothers, friends, family, relatives, allies, comrades & psyco peoples!!! Are you a non-conforming, anti-imperialist, anti-oppression psyco type cyclist? Have you been interested in collaborating with someone here in the hood? 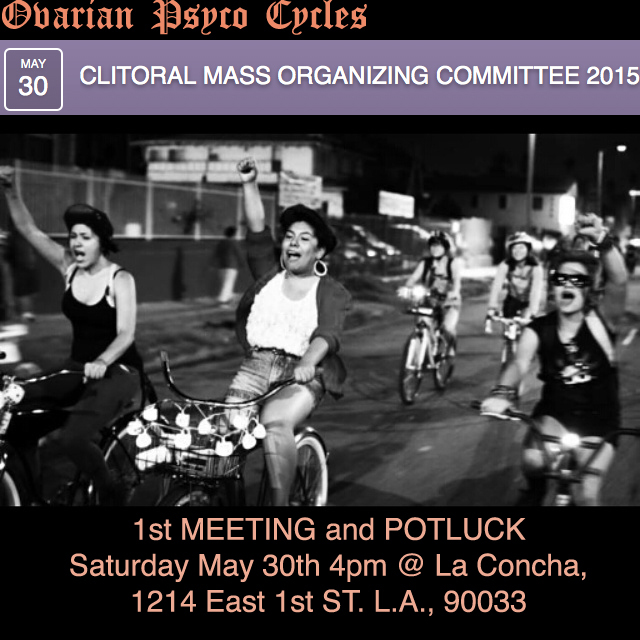 Come out and help organize Clitoral Mass 2015. Bring a plate and ideas to share. All are welcome to participate… we are not a club, we are not a clique, we’re a movement of many. 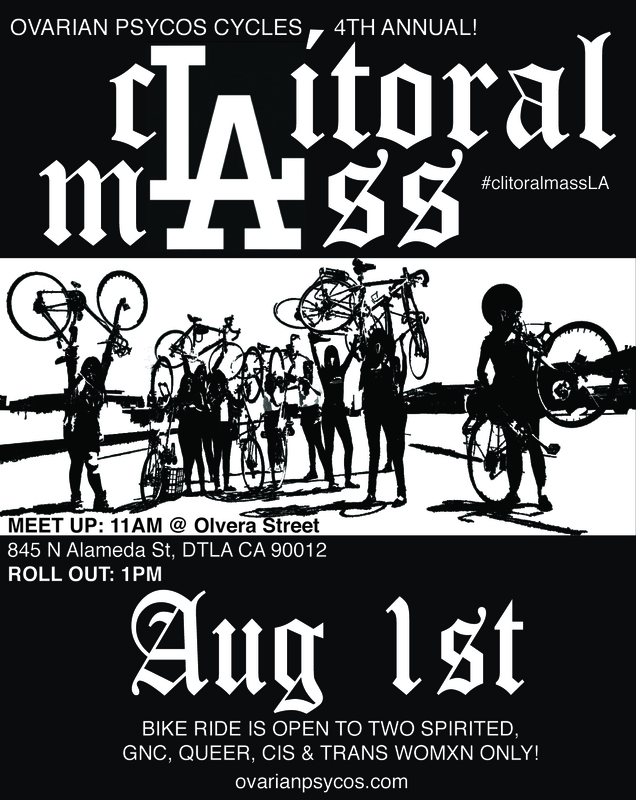 And SAVE THE DATE: Clitoral Mass L.A. 2015, Saturday August 1!!!! 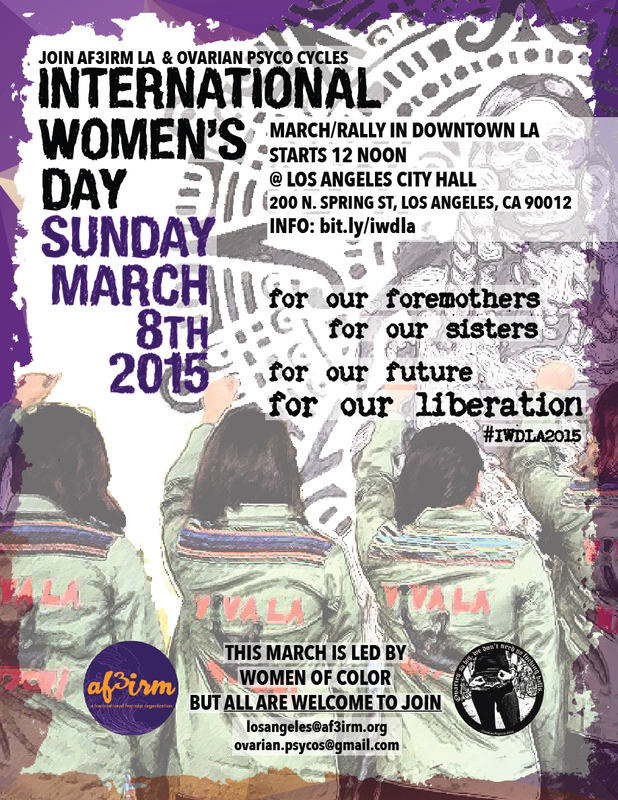 Happening Sunday March 8! More details coming soon!